Innsbruck is an adorable city with its cozy old town centre and its location next to the unexpectedly fast flowing Inn River and surrounded by gorgeous mountains. I had a grand time in Innsbruck, as did our friend Victor who came along for the holiday, but I think Blai had a few stressful moments as this was a working holiday for him. We were mainly there for a music festival and with rehearsals and concerts every evening, I had to rejigger our eating schedule. Every day in Innsbruck, we started with a decent enough continental breakfast at our hotel, a large late lunch, a snack if required and finally, a late night visit to a wurst stand in the centre of town. Gotta keep us fed. As you’ll see below, we did pretty well! No photos of the breakfast as I’m barely functioning in the morning but of particular note was the fresh crusty buns served up by our hotel. 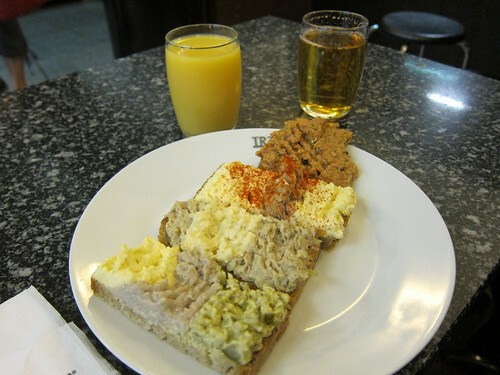 Actually, all the bread we tried in Innsbruck was very good, even those served by the ubiquitous Tyrolean chain, Der Bäcker Ruetz. 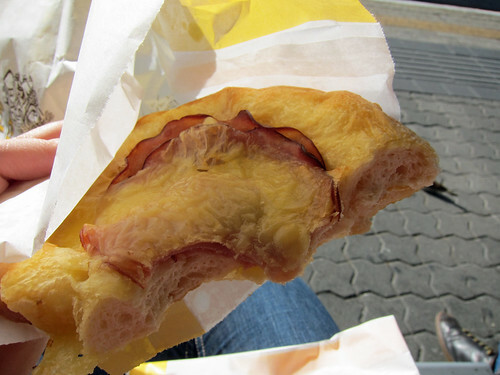 This was a Snackbreze, a delicious pretzel topped with ham and cheese. 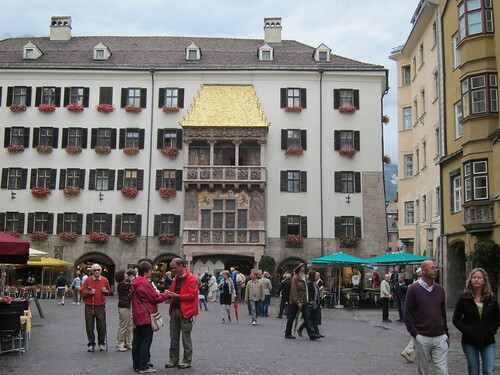 We had two nice lunches in Innsbruck and one average one in nearby Schwaz (I’ll leave that last one out) – prices were certainly more affordable than in Zürich, with our lunches costing about €20 a head. Our first lunch after exploring the city was at Weisses Rössl, a hotel restaurant with a good selection of Tyrolean specialties. 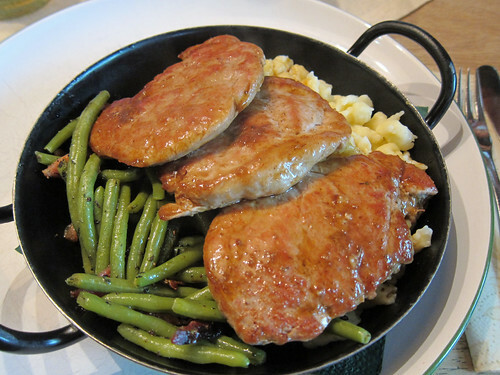 We started with their hauspfandl (the dish of the house), which was pork fillet cooked with garlic, caraway and brandy served with green beans with bacon and spätzle. This was some kind of trick plate or something – there was a lot more food in that dish than I expected. 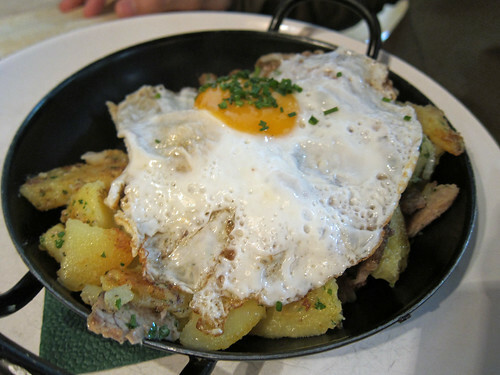 A traditional Alpine dish of Tiroler Gröstl was as you’d expect of an Alpine dish: a chopped beef and potato hash topped with a fried egg. Seriously filling grub for a serious day out in the mountains. A cabbage and bacon salad came on the side. 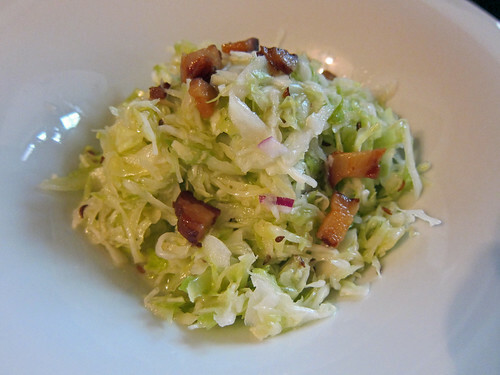 Gosh and golly, this was possibly the tastiest cabbage salad I’ve ever had (step aside, coleslaw) – love that combo of fried bacon and caraway seeds. 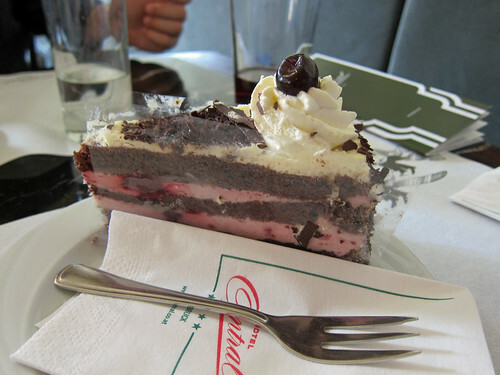 The next day, after a visit to Schloss Ambras, we descended back down into Innsbruck and had lunch at Cafe Central, one of the city’s Viennese style coffee houses. 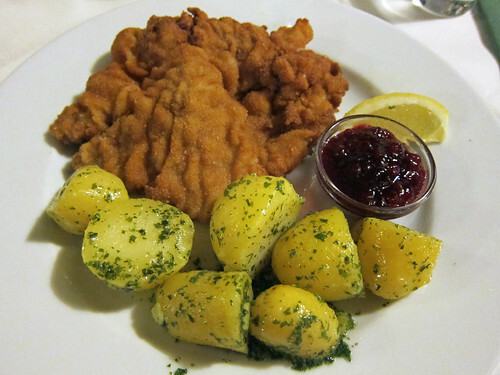 Having missed Wiener schnitzel, we proceeded to order their butter fried version; it was delicious and well fried but just a little too thick. 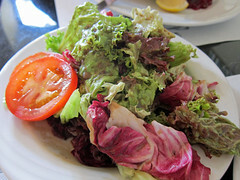 For everyone who exclaimed about our lack of vegetables on our Vienna trip, look! Salads! 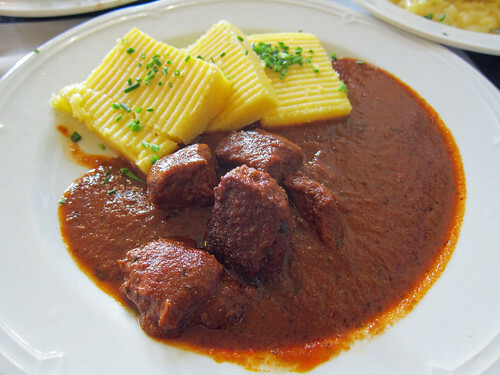 We also shared a rindergulasch with polenta. 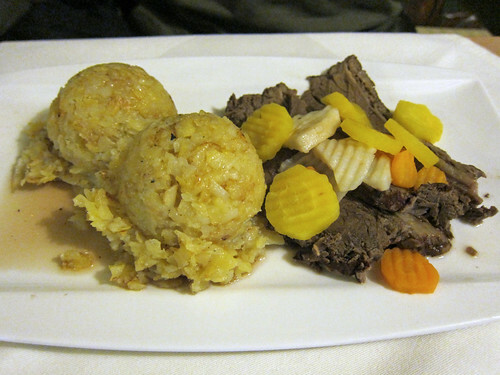 While I enjoyed the combination of polenta with the stew, the gulasch was too salty to eat by itself. 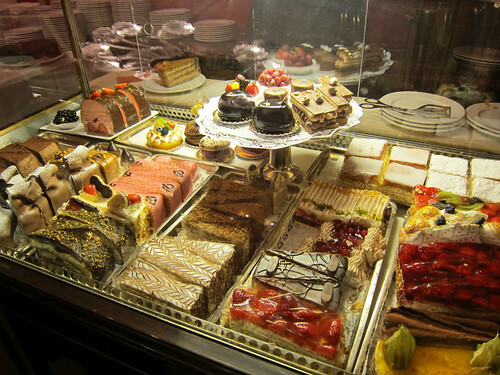 And we couldn’t leave a Viennese-style kaffeehaus without having cakes. 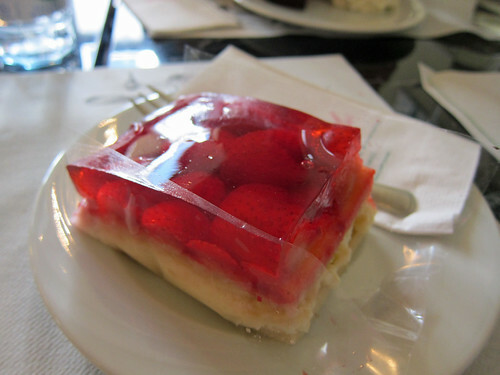 They perhaps didn’t live up to the heady heights of those we tried in Vienna (especially the whipped cream) but were still delicious; my favourite was the strawberry cake with its layers of strawberries in jelly, custard, cream and sponge cake. At night, our Würstelstand of choice was the one underneath the Golden Roof (see the third photo in this post) – this makes it seem like we were discerning but really, there were only two to choose from and this one was on the way back to our hotel. On average, it was about €3 per sausage or pair of sausages and one each was plenty to fill or empty tummies. Our default order was the Kasekrainer hot dog, a long cheesy sausage tucked into a baguette (it tastes better than it sounds) – not sure why I didn’t end up with a photo of it. 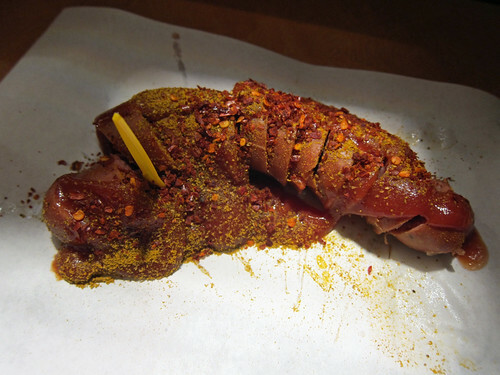 I did end up with a photo of our chilli currywurst – a sliced wurst slathered in ketchup and dusted with copious amounts of curry powder and dried chilli flakes. And with this currywurst, I fall utterly in love with it (my previous experience was with a nasty version involving a curry sauce in Munich)…and the chilli flakes! Inspired. 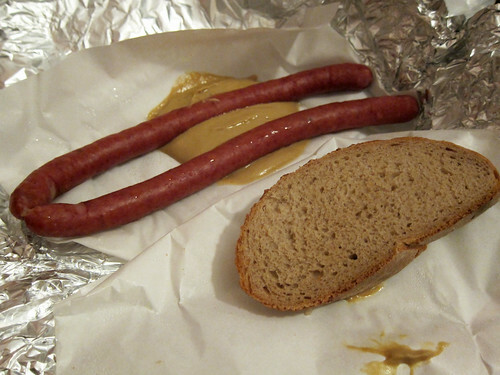 Also, these St. Johanner würste, long smoked pork sausages, are typical of the Tirol region and apparently one is supposed to eat them with mustard and horseradish…. so I failed. Delicious even without horseradish though! I’ve got to mention Handl Tyrol too, a Tyrolean chain of smoked and airdried meat products. We’d snacked on quite a few of their salami products and I bought a few things to take home too. They’re very conveniently located in the Old Town as well as in the train station. Ok, this is the final Vienna post! I wanted to try Trzesniewski, a little sandwich shop that Charmaine had written about, and the only opportunity we could find was on Monday morning. We went to their original shop on Dorotheergasse (on the same street as Café Hawelka) and at first thought it might be closed as their imposing doors appeared to be firmly shut. A quick glance at the opening hours stated that it should have been open – we tried the door and well…yeah, it was open. I blame it on the lack of windows! Sandwich shop doesn’t describe them well; they sell delicate little open face sandwiches and upon entry, we were immediately before a long glass display of them – so many from which to choose! 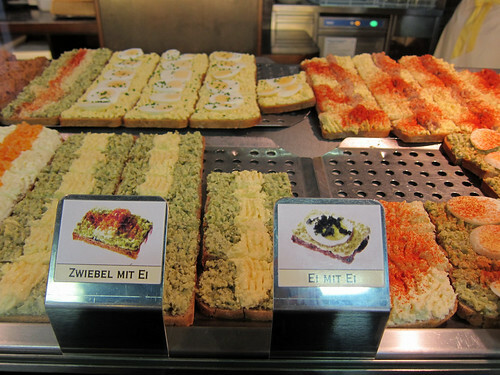 If it’s one thing I’ll remember about Vienna, it’s the seemingly endless choice one is confronted with in the cafes. They very helpfully have a list of their sandwiches all translated in English at the end of the counter….and I only noticed it after I’d ordered, meaning that I’d had to work everything out in German. I now know that Zwiebel is onion. 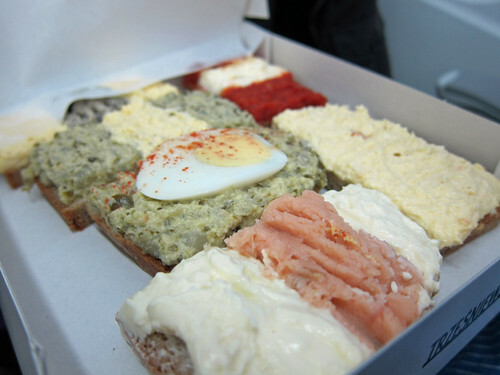 We selected a few to share as a small snack (each open faced sandwich is €1.10) along with a couple of tiny juices. Tiny they may have been but that was just enough juice to quench our thirst. 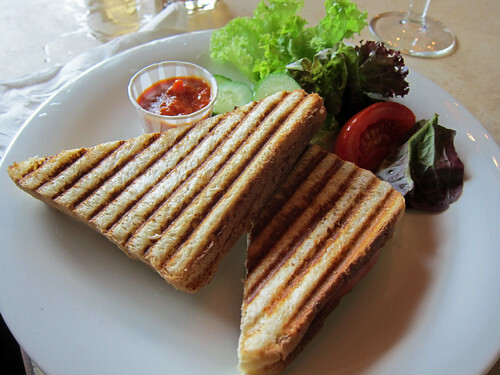 The sandwiches were made of brown bread topped with chopped mixtures. I particularly enjoyed the sardine with onion and the dark red one at the end that was supposed to be tomato but tasted mostly of pickle. A creamy egg mayonnaise mixture features in many of the toppings; I quite like it but there is the chance that you could have it on everything if you don’t choose wisely. It’s not a place to while away the time – most locals don’t even bother sitting down, preferring instead to perch by one of the counters. Many also order a Pfiff (a tiny glass stein of 1/8 of a litre of beer) to drink with their snack. On our way out, this egg with egg topping made me laugh. We only managed this short visit but then how happy was I to discover that a new branch of Trzesniewski had opened at the airport?! It’s in Arrivals and so you’d need to buy your sandwiches before security. We asked to takeaway our sandwiches and the stern lady at the counter (no, not stern, actually very unfriendly) packed our sandwiches into the cutest box with a handy string handle. They made for a delicious light dinner on the airplane. They were certainly much nicer than the egg sandwich served by our airline. On the takeaway box was their web address and I was amused to see that it’s www.speckmitei.at – I think many people must have trouble spelling its name! There are other branches – do check out their website. That brings my Vienna posts to an end – all my photos from this trip can be found in this Flickr photoset. 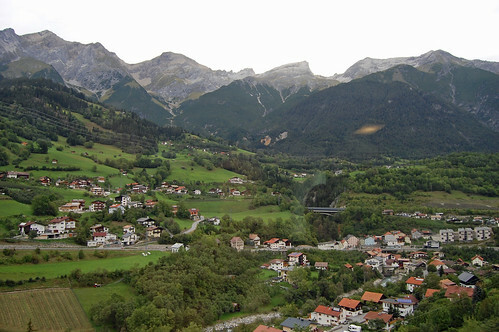 That’s not all from Austria though – I’m heading to Innsbruck next month and I welcome any and all suggestions for the city please. 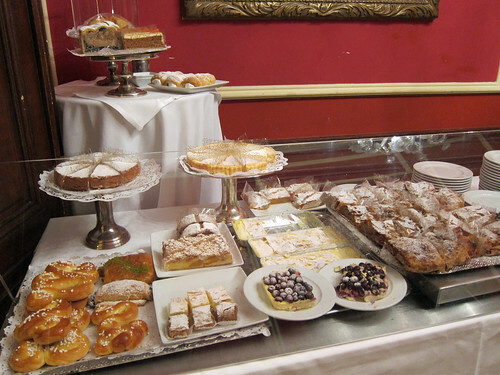 I think Demel is classified as a Café-Konditorei – a patisserie with a café – and I don’t think there is one more grand in Vienna. Today, it still displays its title of Imperial and Royal Court Confectionery Bakery, it having supplied the Imperial palaces. Here, read this article about Demel written in the 1967 for Gourmet magazine. Fancy and exclusive! Now here’s a more recent article about the konditorei written for Saveur magazine – it explains how Demel had been purchased by a gourmet food company in 2002 and how the general riff-raff like us can now visit. We visited on a Sunday at about brunch time and just managed to grab a table before the hoards of post-mass churchgoing Viennese descended upon the cafe. We sat upstairs, which I do recommend as one can choose one’s cakes in relative peace, without the crowds trying to order takeaway downstairs competing with you for space. There’s also more light upstairs. There’s a menu for all the drinks and savouries and some desserts but the real fun comes in choosing your cake from the displays. How can one choose?! 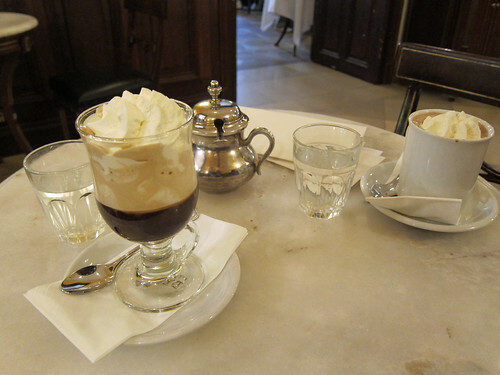 First, though, drinks: a hauskaffee (brewed coffee served with whipped cream) for me and a hot chocolate for Blai. The coffee was lovely (how can you go wrong with whipped cream?) and while Blai’s chocolate seemed very sweet at first, it started to grow on us. 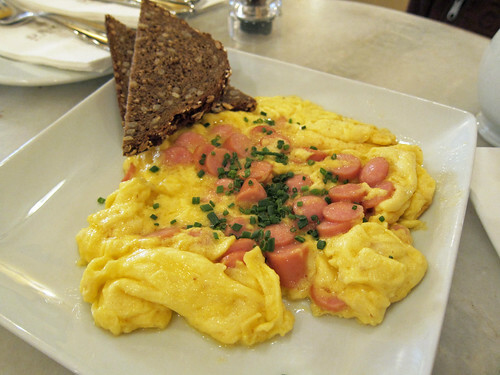 We also ordered a savoury dish off the brunch menu: Würsteleierspeis’ mit Schwarzbrot, deliciously soft scrambled eggs cooked with sliced frankfurters, something I sought to recreate almost immediately back home. The dark brown bread was just like the kind I avoided as a child but that I now love, all chewy and nutty. Of course, this was the moment I was waiting for – time to choose our cakes! After a lot of hmm-ing and haw-ing, I settled for a slice Esterhazytorte, thin layers of hazelnut sponge sandwiched together with buttercream and topped with fondant. Blai had already chose his from a distance, the rather pink and flashy Elisabethschnitte, sweet strawberries embedded in light, fluffy strawberry mousse and coated in chocolate icing. They were both incredible. 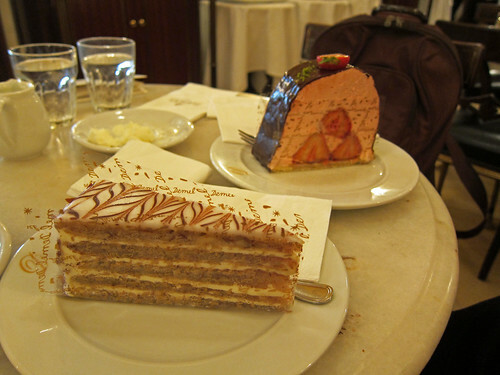 We returned to Demel the following day, Monday, our last day in Vienna, to try more of their confections. I was surprised to see just as many locals as tourists there on this weekday. Again, something savoury first (having just cakes for brunch always seemed wrong to me!) 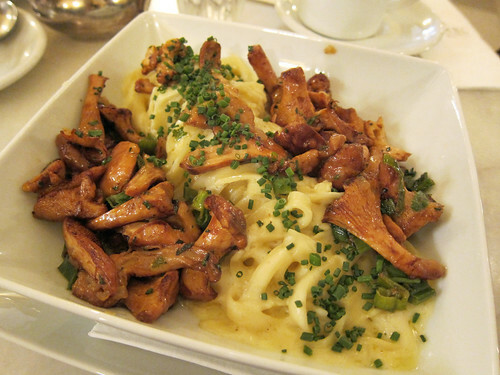 – Frische Eierschwammerl auf Tagliatelle – sauteed fresh chanterelles with tagliatelle in a delicious white wine and cream sauce, ordered off a special menu. I had seen lots of chanterelles for sale at the Naschmarkt that weekend and they must’ve been in season. Then more sweets! 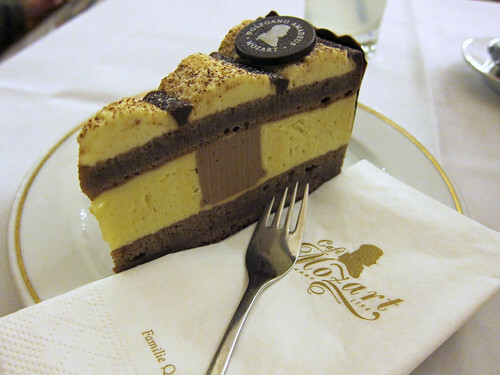 Blai wanted to try their Sachertorte to see how it compared to that at the Sacher Café. 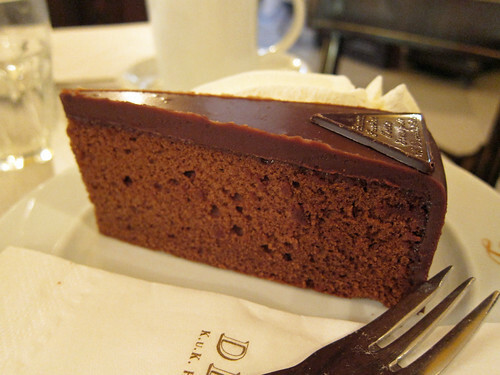 The main difference seems to be in the number of layers of apricot jam – Demel’s had one while the Sacher Café’s had two. I certainly preferred that from the Sacher Café; more jam provides more moisture and their chocolate icing had a better flavour. 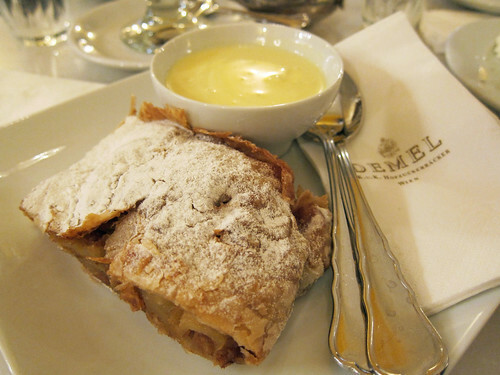 I chose a slice of apfelstrudel with a side of vanillesauce, like a fantastic hot creme anglais. 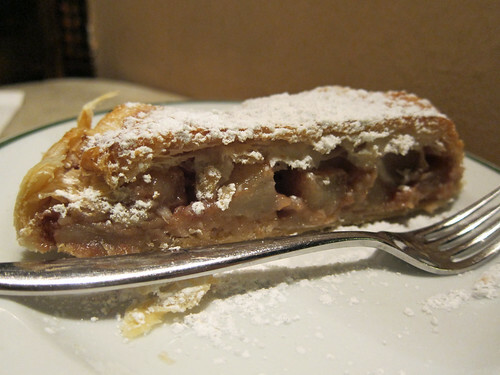 The strudel was chock full of apples, raisins and cinnamon and was gorgeous with the sauce. I only wish they hadn’t heated up my slice as the pastry had lost its crispness. 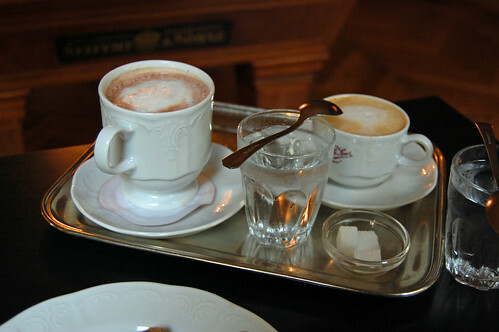 As with all of Vienna’s cafes, you’re welcome to stay and linger for as long as you require. I could have stayed the entire day! I couldn’t leave without a little souvenir and we took home a small marmorgugelhupf, possibly the best marbled butter cake I’ve ever had. Highly recommended. Can you tell I absolutely adored Vienna? After dinner on our first night in Vienna, we went for a little stroll in the centre, making the most of the long summer day. When it started to get too dark, we went off in search of Café Hawelka; in hindsight, this was probably my main objective for the night! After a bit of a search (I had accidentally mixed up Dorotheerstrasse with Dorotheergasse), we made it and settled into our table in this lovely, bohemian-looking café close to 10pm. The very short menu is scratched onto a tiny chalkboard on the wall. 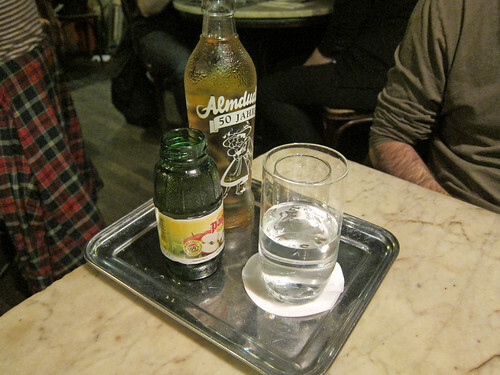 We skipped the caffeine so late at night and instead had an Almdudler and an apfelschorle (apple juice and sparkling water – it’s very refreshing). 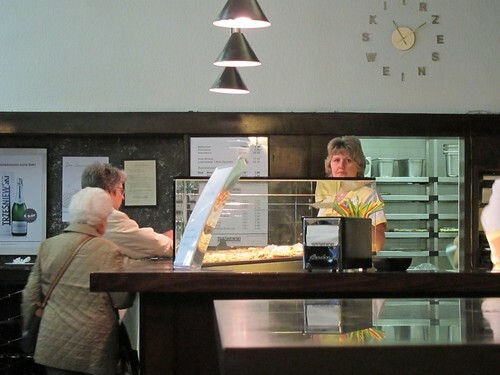 We ordered a slice of apfelstrudel and their famous buchteln; our waiter told us that it would be about 5 minutes till the buchteln would be ready and we munched on the delicious strudel with its crispy pastry while we waited. 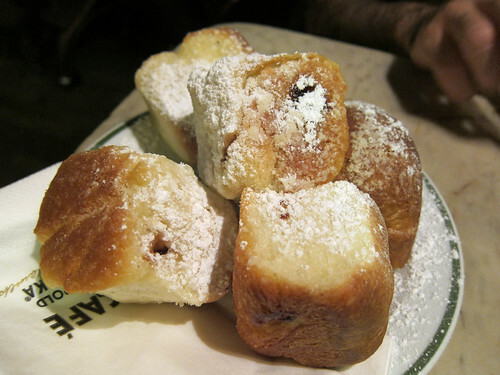 At about 5 past 10, the waiters rushed out from the back with numerous plates balanced on their arms, plates piled high with buchteln dusted with powdered sugar, looking like snow topped hills. They were hot from the oven and it took restraint to not bite immediately through the crisp buttery crust into the soft, brioche-like interior and spill the molten hot powidl (a plum conserve) filling onto your chin. We stayed and lingered – the place is open until 2am most days – and so ended our first night in Vienna. 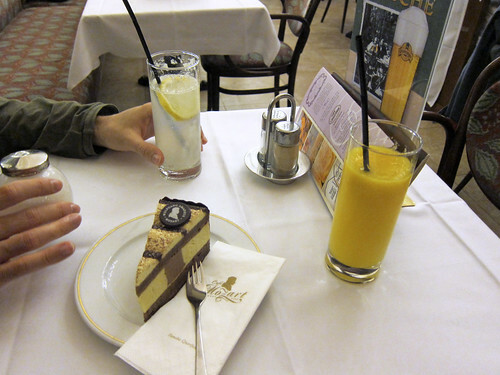 And that started our love affair with the Viennese café – this first experience coupled with the not-so-hot weather during our visit had us cancel plans to visit any palaces and instead make time for even more cafés! 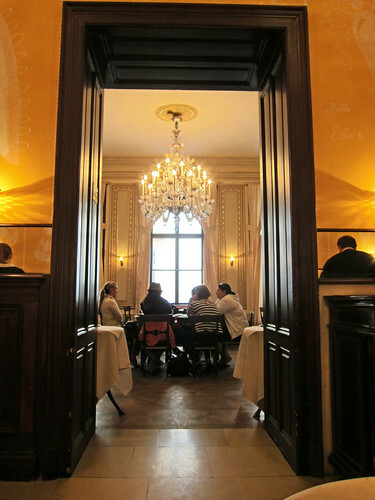 I’ve put the photos from Café Sacher at the Sacher Hotel here as it is technically a cafe, albeit a very touristy one. 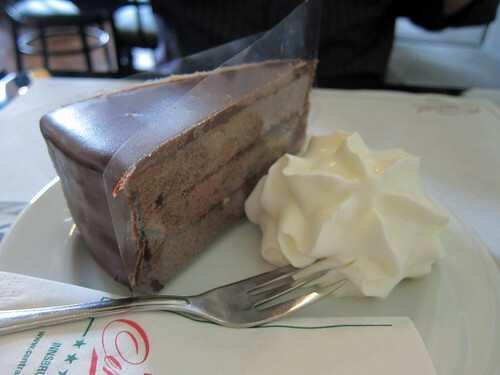 Saturday morning we were there, of course, for the Original Sacher-Torte, with its two layers of apricot jam, a chocolate sponge and thick layer of chocolate icing; it’s a little dry on its own and so needs that side of whipped cream. But first a bit of something savoury as it was near lunchtime; we chose to have our lunches in cafés too. 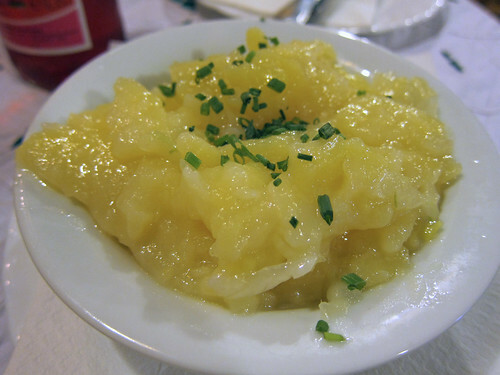 We shared a pair of Sacherwürstel served with mustard and freshly grated horseradish; there’s only one in the photo as the other is kept warm for you and the eagle-eyed waiter whisks it over when he sees that you’re about to finish your first. 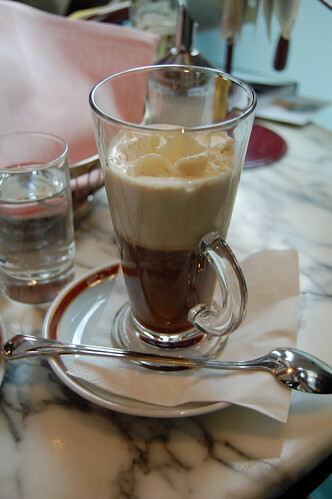 I also had an einspänner (literally a one person carriage), the name for a large coffee with whipped cream – turns out I love whipped cream with coffee. I think Blai had another Almdudler. 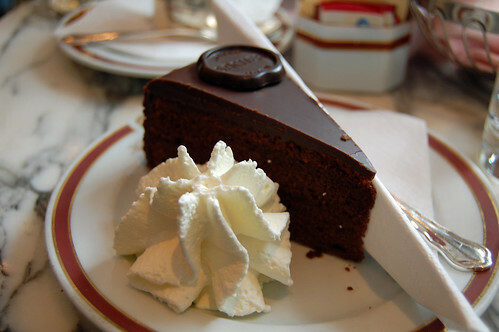 It’s certainly very touristy but it’s still a lovely café and is the place to try a slice of Sacher-Torte. 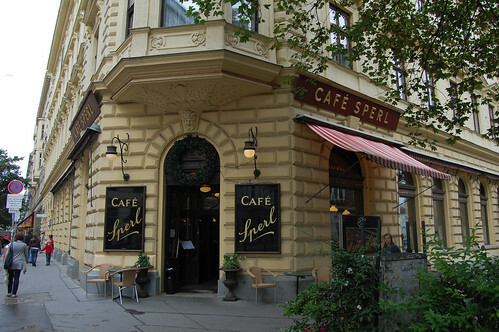 Café Sperl, which we visited on Saturday afternoon after seeing Klimt’s Beethoven Frieze at the Secession, was probably my favourite of the traditional Kaffeehäuser we visited, with its friendly host, stern waitresses and gorgeous room. There are newspapers to browse and billiard tables at which to play. It’s larger than Café Hawelka and had a larger menu to match – it’s possible to have a full meal here. We were here for just coffee and cake – a hot chocolate for Blai and a melange (similar to a cappuccino) for me and I went up to their little display of cakes to choose our sweet. 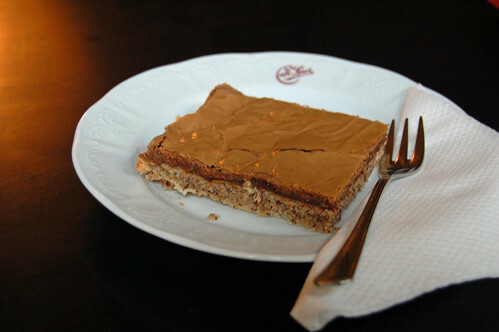 One particular slice was moving quickly and I pointed at that one; it turned out I’d chosen what must have been one of their specials – the Sperlschnitte, a slice of thin hazelnut sponge covered in a chocolate ganache. On Saturday night (yes, Saturday was a very café heavy day), we headed for Café Mozart but didn’t linger long there. Their Mozarttorte was fine though nothing spectacular and though the room is very pretty, I couldn’t shake the feeling that it was quite touristy. 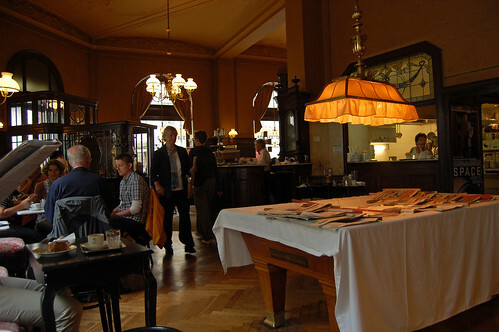 The café is run by the Querfeld family, who also run a number of cafés in Vienna, including the famed Café Landtmann and Café Museum. And finally a modern cafe – Café Leopold at the Leopold Museum in the MuseumsQuartier. We had just come out of the Sammlung alter Musikinstrumente on Sunday afternoon and we were starting to flag. A couple of juices and a Toast mit schinken und käse, pikante paradeissauce (toast with ham and cheese with a spicy paradise sauce, which was tomato based) here gave us enough energy to visit the museum. It doesn’t feel like one to linger at though as space is quite tight but we were never rushed. We arrived to a grey and drizzly Vienna two Friday evenings ago but this couldn’t get our spirits down – we were finally in Vienna, the city that eluded us last Christmas, the city that I’ve been dreaming about for years, the city of coffee houses and cake. 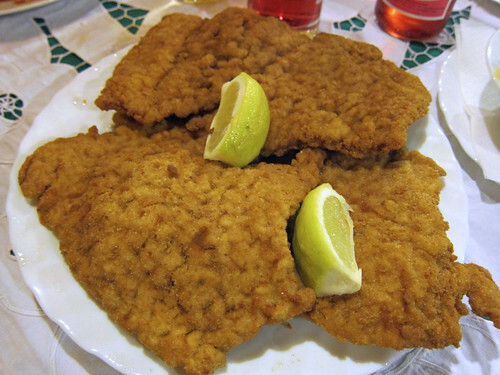 Oh yes, and the city of Wiener Schnitzel: we went through a lot of it. 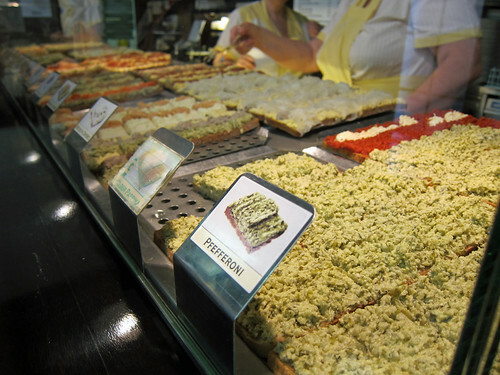 My plan for the trip, I mean apart from the sights, was to get as much Wiener Küche (Viennese cuisine) into us as possible. I already knew I’d love it! By the time we made it to our hotel, it was already dinner time but I hadn’t booked anything in advance. A chat with the front desk confirmed what we anticipated – a walk down to try Figlmüller and their famed Wiener Schnitzel would probably result in our standing in a queue for a very long time. She instead recommended a gasthaus nearby and that’s how our first meal in Vienna came to be at Gasthaus Nestroy. 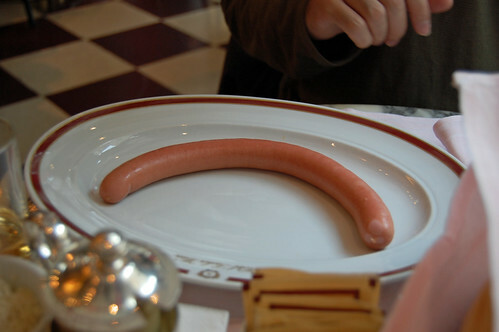 This local restaurant served exactly what I was looking for – Wiener Küche. It was surprising to see that Austria still clings on to its rights to smoke indoors but luckily, the smoking and non-smoking areas are well separated. We went with non-smoking and were given a short menu listing all manner of Viennese dishes (we later realised that this was the abridged menu probably for tourists – I was in a humph for a while upon learning this but then again, we still would have ordered exactly what we did and not steak tartare as the locals did). A Wiener Schnitzel mit Petersilkartoffel und Preiselbeeren (veal schnitzel with parsleyed potatoes and cranberries) and a Tafelspitz mit Röstkartoffeln (Viennese boiled beef with roast potatoes) were what we ordered for our first meal in Vienna. 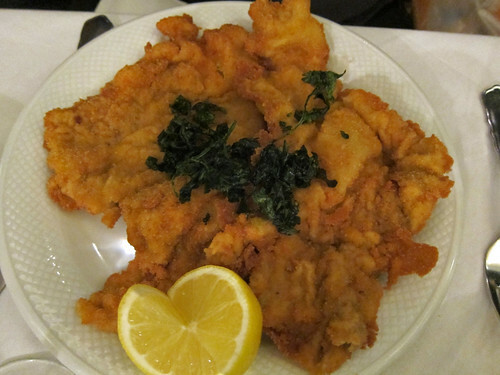 Our first Viennese schitzel in Vienna was excellent – greaseless and crisp and thin yet not dry. We found this to be the case of all the schnitzels we sampled; all were excellently cooked (yeah, we had three over our long weekend there). And they were always big too. 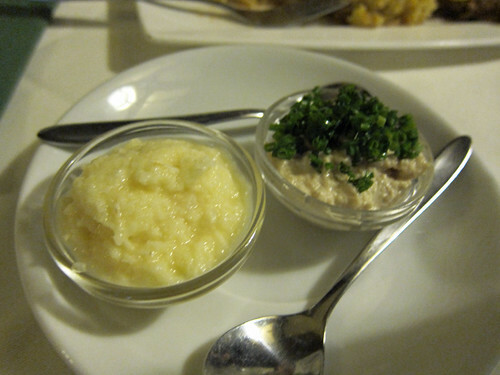 The Tafelspitz (boiled beef) was much tastier than it sounds – we greatly enjoyed this with its accompanying chive sauce (it reminded me of a tartare sauce) and apple-horseradish sauce. The roast potatoes were in a dumpling form – the cooked potatoes had been chopped up and bound together and tasted like the best hash browns ever. Prices were certainly reasonable and we were the only tourists in the restaurant that night. It’s unlikely you’d go looking for it though unless you were in the area (north of the Danube, near Nestroyplatz station). 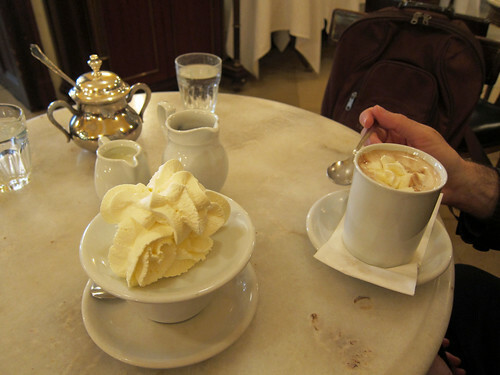 As we had a limited time in Vienna, we planned to have proper sit down meals in the evenings while trying as many different coffee houses during the day (uh…and night. But that’s a whole other post!). 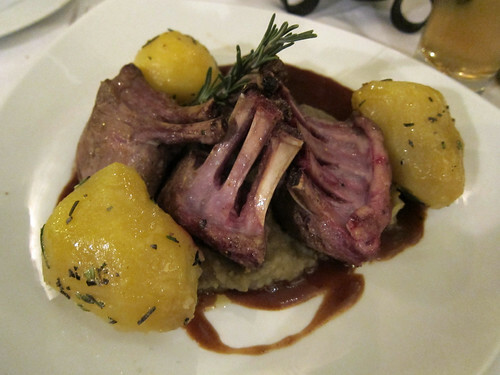 The next day, after a long and exhausting afternoon at the Kunsthistorisches Museum, we headed to a beisl (guidebooks liken them to the Austrian version of the Italian trattoria) recommended by Ute at Hungry in London – Alt Wiener Beisl “zu den 2 Lieserln”. 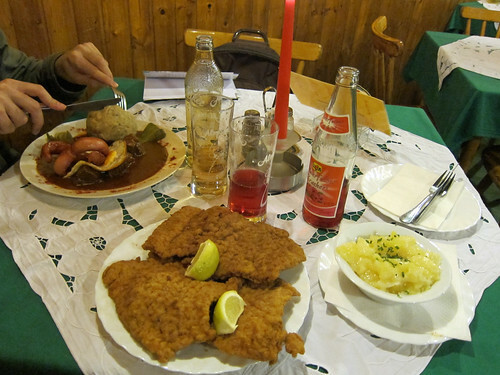 We ordered yet another Wiener schnitzel (pretty sure it was still veal) and a fiakergulasch (coachman’s gulasch). 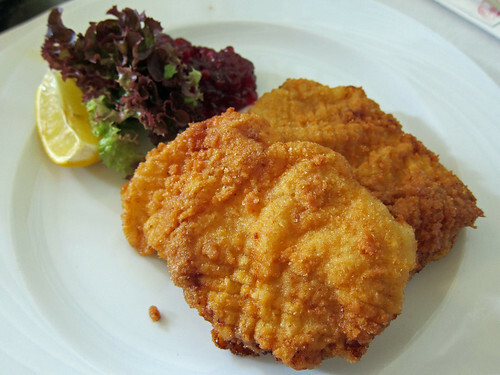 The schnitzel arrived as three cutlets overlapping each other as well as the plate itself – it was a massive portion. 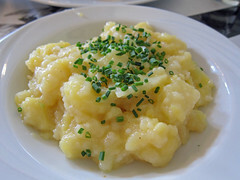 It was delicious too as was the side dish of potato salad, all cold and tangy. 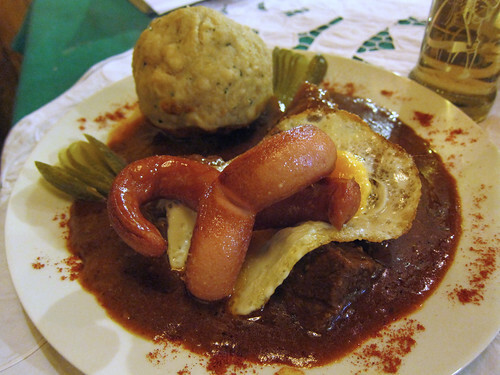 The fiakergulasch was a delicious paprika rich beef stew served with a fried frankfurter, a fried egg and pickles. I hadn’t expected to find gulasch everywhere in Vienna but then memories of history class and the Austro-Hungarian empire hit me and well, duh; the version in Vienna is supposed to be quite different from the kind you find in Hungary though. This gulasch’s thick sauce reminded me very much of a slow cooked curry. On our final night in Vienna, the heavens opened just as we came out of the Leopold Museum and my sandals were looking like a bad idea. That coupled with it being a Sunday night when many restaurants were closed meant that finding a good place to eat would prove to be a little more difficult. 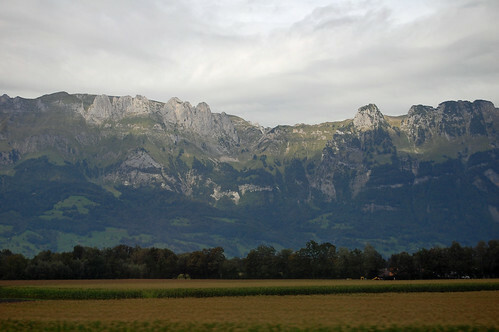 Again we tried Figlmüller and again we failed but ended up at another touristy spot – Griechenbeisl. While it was quite touristy (it being one of the oldest restaurants in Vienna, dating back to 1447), it was quite fun eating there as we were seated in the Mark Twain room, a room with its ceiling covered with the signatures of the famous dining in this establishment. Mozart! Beethoven! Mahler! Um…Johnny Cash? At first we were skeptical – really? Is that REALLY Mozart’s signature up there? But we haven’t found any evidence to the contrary online and so we’ve come to accept what we saw. The food wasn’t too bad but it was certainly expensive. We had yet another Wiener Schnitzel vom Kalb mit Blattsalat (veal schnitzel with a leaf salad) and also a Koteletten vom Steirischen Lamm mit Rosmarinerdäpfel und Melanzanipürree (roasted Styrian lamb chops in herbs with rosemary potatoes and aubergine puree). A side of roast potatoes was ordered too. The schnitzel was again excellent, as I’ve come to expect anywhere in Vienna, but the lamb chops were perhaps a bit too rare. The aubergine puree was delicious. We had our first and only proper Viennese dessert here – a Mohr im Hemd (the uh…not politically correct Moor in a Shirt). 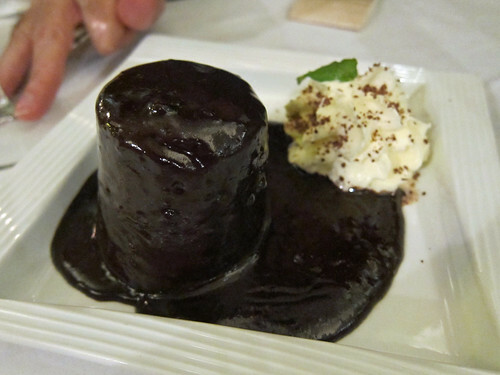 This steamed chocolate cake with a thick chocolate sauce and whipped cream went down a treat. This restaurant with its history and obvious attraction to tourists was more expensive and just the food part of the bill came to €50. 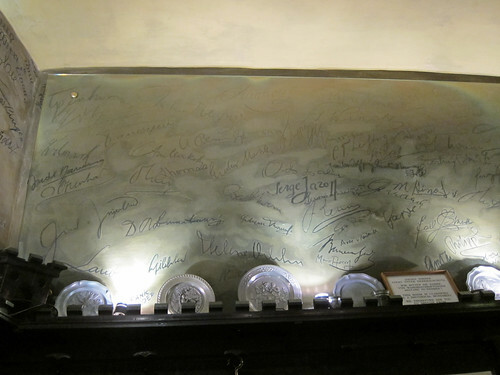 The food was fine but it’s the building one really comes for; if you’re not seated in the Mark Twain room, ask your waiter to see it – they’ve got this whole spiel where they point out the major signatures with a long stick. All three restaurants are either in or not far from central Vienna (within the Ringstrasse). As anticipated, we loved Viennese cuisine and I even brought back a few ingredients to try to recreate some of it at home. Next up, the Kaffeehäuser!